Opah or moonfish is found in Hawaii and has a fatty flesh, somehow like tuna and salmon. It’s a unique fish due to its flat and round shape and color. I really like its texture and you can prepare like you would any fish with that dense texture. “Nage de poisson” literally translated into “fish swim” is a culinary term used to describe a fish or seafood that is cooked in a broth of court-bouillon (I believe court-bouillon is also used in English). It’s a light and healthy cooking method and very flavorful, depending on what you use on your broth. Of course, there are many ways to flavor the broth, you could also use saffron, fresh herbs, spices, etc.. but I wanted to keep it simple, fresh and clean. 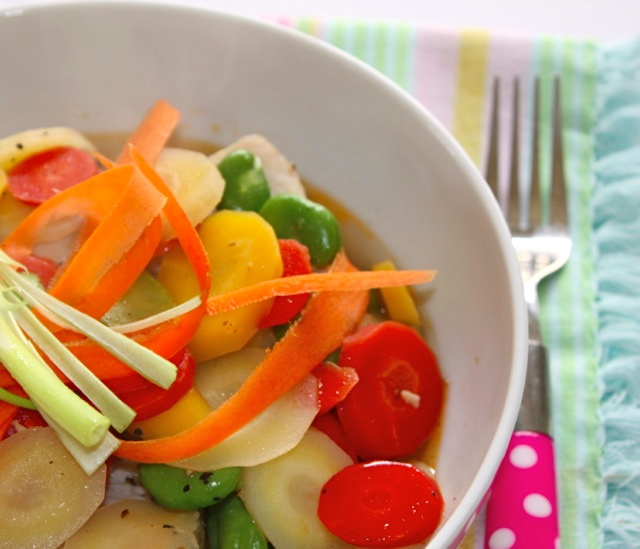 The sweetness of those colorful carrots combined to the vinegar added in the broth make this dish very well balanced. Usually, this cooking method is quite popular among those who want to keep a thin waist line…it’s healthy while being delicate and flavorful, so a winner in my book. Bring water to a boil and cook fava bean for 2 minutes. Remove from heat, drain and peel the beans. Set aside. 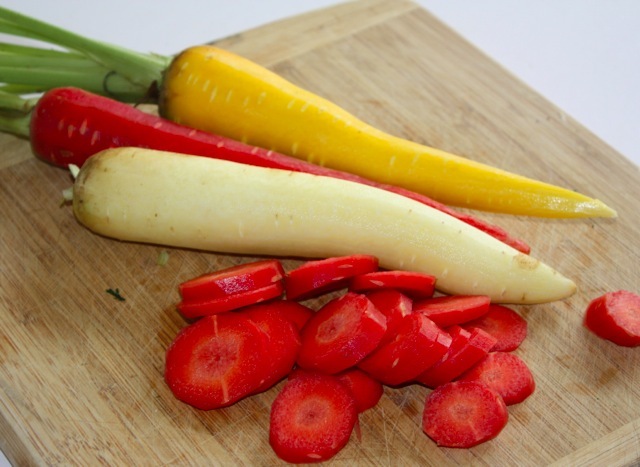 Heat olive oil in a pan and add carrots. Cook for a few minutes. Add wine, sugar and vinegar, cook at high temperature and let the wine reduce. Add Opah and cover with water. Add salt. Let cook the fish until cooked all the way through, then add fava beans. 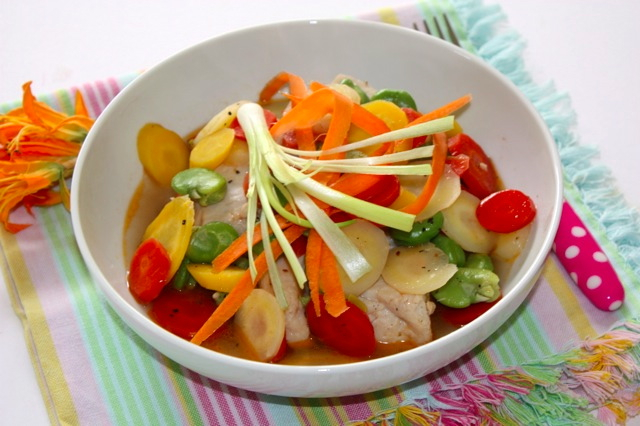 Serve in soup plates, with broth, fish in the center and the vegetables on top. Add a good amount of freshly crushed black pepper on top. This entry was posted by silvia on August 22, 2012 at 3:59 am, and is filed under Fish/Seafood. Follow any responses to this post through RSS 2.0.You can leave a response or trackback from your own site. J’adore cette belle recette estivale!